Chelsea Jackson is an Atlanta yoga teacher who writes a blog called Chelsea Loves Yoga, where she is most known for her “Yogi in the Community” series. There, she interviews yogis in Atlanta and beyond about their yogic paths, missions and inspiration. We decided to do a little mash-up where she interviewed me and I interviewed her! How did you first come to yoga? What keeps you coming back to the mat? I began practicing yoga for the physical benefits when I tried to lose about 50 pounds in college. However, it was in 2004 when my best friend and college roommate was murdered, that I began a more spiritual path of yoga. After my friend’s death I was very angry, confused, depressed, and self-destructive. This is why yoga is so very sacred to me. This is what keeps me coming back to the mat. Yoga saved my life—literally. It is difficult for me to identify exactly what it is about the practice, but I do know that yoga teaches me how to love myself, while simultaneously confronting my imperfections. Yoga teaches me how to use unfavorable circumstances as an opportunity for growth and transformation. What was your inspiration and intention behind Chelsea Loves Yoga? I created Chelsea Loves Yoga because I wanted to create and cultivate a space that focused on community and the multiple aspects of yoga. The intention behind this site is to showcase the ways in which yoga is present in our daily lives. I get a lot of questions about yoga and comments like, “I really want to try yoga but I am not in shape, or I’m not flexible.” Chelsea Loves Yoga is a space that highlights “regular-everyday folks” practicing awareness, service, and life-affirming choices. In addition to this, I want Chelsea Loves Yoga to be a space that supports healthy dialogue from a “yogic perspective” around uncomfortable topics that people often avoid like racism, social justice, and the process of healing. You chronicle “yogis in the community,” who of those you’ve interviewed inspires you most? 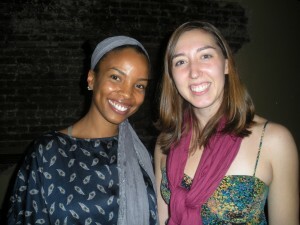 I can honestly say that all of the Yogis in the Community I have interviewed inspire me. Each time I hear a new story I am inspired. Many of the unique individuals I have interviewed inspire me because of their service to the community, their ability to overcome obstacles, and their fearlessness to transcend boundaries imposed on them by society and life. If I could take a couple of qualities from each person I’ve interviewed thus far, that would be my most inspiring interview. What is the greatest lesson you’ve learned from your yogi in the community interviews? The greatest lesson I have learned from my Yogi in the Community interviews would have to be this thread that connects us all—fearlessness. In almost every interview, I have learned that there is usually this moment of tension that led to transformation. I am learning through talking with people about their path, that in most cases they were faced with an event (sometimes tragic) that eventually led them to yoga. I am learning that everyone has a story that needs to be told. What legacy do you hope your blog will leave? It’s funny, I was thinking about this the other day—the way that the internet, social media, and print in general leave this paper trail (a sort of timeline of events). It is my intention to never erase or ignore a post I’ve created, a comment that has been made, or a conversation that has occurred, including the intense ones. I hope that this website leaves behind a record that yoga is not a superficial practice that only encompasses beautiful postures and toned physiques. Yoga is life and Yoga is real. I hope that Chelsea Loves Yoga and the community who supports the conversations on the blog continue to contribute to the world of Truth-Seekers who approach life with, consciousness, fearlessness, and compassion. Chelsea Jaya Dasi is my mentor. She is awesome! I really enjoyed this Leah! Can’t wait to collaborate more in the future!